I remember my mother suffered through that hot and humid day at SWT for Josh and me, so that we could get some autographs. After practice the team set up tables and gave out signatures. On the way out to the parking lot we caught Highsmith, and then we followed behind Zendejas (who was driving his Lamborghini,) over to the team dorms. It was there that Josh was infamously run over by Bruce Matthews, who then effortlessly picked him up by one arm, dusted him off, and profusely apologized with a hearty smile. Jerry Glanville would go on to coach the Oilers to another playoff appearance, then move on to coach the Atlanta Falcons. He then went into the broadcasting booth and then back into coaching for a few years at Portland State. David Williams, T was drafted out of Florida in 1989, and played primarily for the Houston Oilers during his 9 year career. He’s best known for an instance called ‘babygate’ where he skipped a game in favor of seeing his wife through the child birth of their first son and then grabbed the ire of his coaches who fined him and then the ensuing media storm that followed. Alonzo Highsmith, FB was drafted in 1987 from Miami. A powerful inside runner, Highsmith would have had a stellar career if not for multiple knee surgeries that shortened his career. After football he went on to be a professional boxer and now is a scout for the Green Bay Packers. Patrick Allen, CB nicknamed ‘doc’ was an all-pro honorable mention who had 16 breakups in 1987. He played for 7 years and had 7 INTs, which was highly misleading considering he was pretty good in the Oilers man to man coverage system. Eric Fairs,LB was a backup LB who started 3 games in 1989, notching 2.5 sacks and 2 FR that season. He played for 6 years for the Oilers and 1 for the Falcons in 1992. Tracey Eaton S played for 5 seasons in the NFL notching 3 picks in 1989 for the Oilers, and a pick of Jim Kelly that year in the playoffs, then fled in the Oilers mass exodus of free agency in 1990. Also had a spectacular highlight where he was flipped by the receiver right after he makes the interception that is making the rounds about Youtube. Kenny Jackson was a former 1st rd pick of the Eagles in 83 who had a one year stint with the Oilers. He finished his career with 126 receptions for 2,170 yards and 11 TDs. Coached WRs at Penn State and now is a sideline reporter for the Big Ten Network. Tony Zendejas was originally a K in the USFL that came to the team in 1985 when the league folded. Zendejas leaving the Oilers in 1991 via free agency particularly stung as he would go on to kick the first perfect season in FGs for the Rams and five more years while the Oilers would struggle to find his replacement until they landed Al Del Greco. Jay Pennison C, another former USFL refugee played for the Oilers from 1985 to 1990. 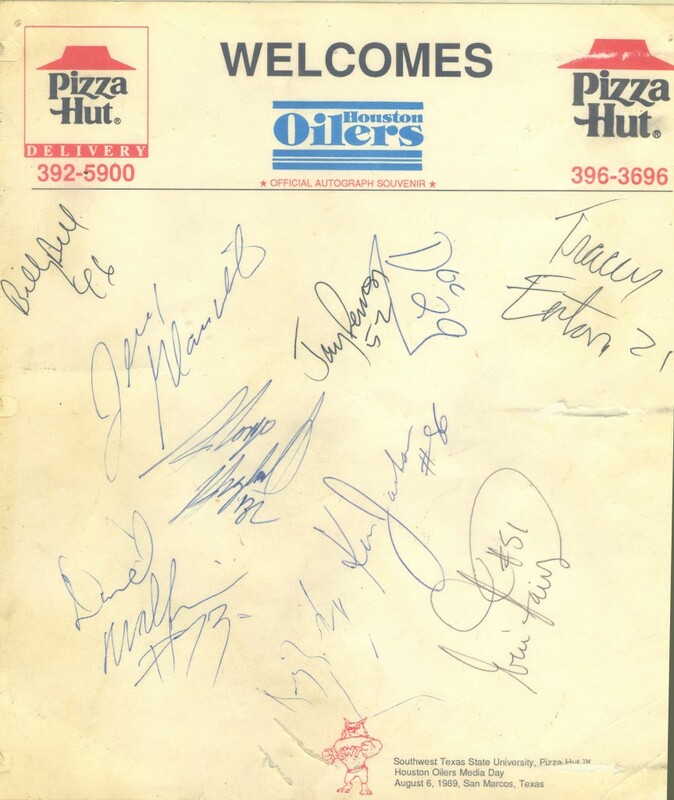 He started all five seasons that he was with the team, which happened to be some of the Oilers best offensive lines. Did acting in a movie or two after his days were over and then focused on his sports pub in Houston. Billy Bell DB played for the Oilers in 1989 and then Chiefs in 1991 where he intercepted 1 pass.